^ 2.0 2.1 2.2 秘鲁总统首访中国 亲自邀请习主席出席APEC峰会. 环球网. 环球时报. 2016-09-14 [2016-10-07]. ^ 4.0 4.1 4.2 4.3 中国同秘鲁的关系. 中华人民共和国外交部. 2016年7月 [2016-10-06]. ^ 秘鲁作家称土语词汇、音乐与中国多有契合 李克强：我们是老乡. 观察者. 2015-05-24 [2016-10-07]. ^ 领侨事务. 秘鲁华人华侨简况. 中华人民共和国驻秘鲁共和国大使馆. 2004-06-15 [2016-10-07]. ^ 中秘双边经贸关系简况. 中华人民共和国驻秘鲁大使馆经济商务参赞处. 驻秘鲁经商参处. 2015-05-15 [2016-10-07]. 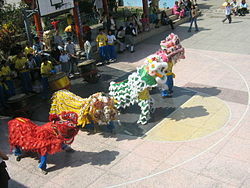 ^ Peru ratifies free trade deal with China. AFP. 2009-12-06 [26 December 2009]. 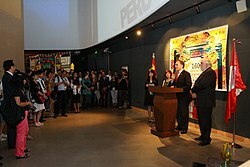 ^ China-Peru FTA to take effect in mid-January. Xinhua. 2010-01-05 [5 January 2010]. ^ Jae Park(2013),Cultural artifact, ideology export or soft power? Confucius Institute in Peru, International Studies in Sociology of Education, 23(1), 1-16. ^ 秘鲁全国哀悼日悼念中国地震遇难者. 新华网. 2008年5月21日 [2016-10-07].